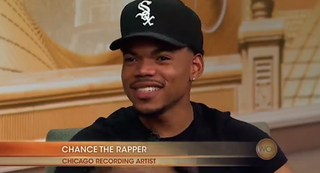 Last week, Chance the Rapper took some Chicago kids on a surprise field trip. Today, he went on Windy City Live, a Chicago morning show, and he was an absolute delight. Chance talked about an upcoming collaboration with Kanye West and some other Chicago artists, and he plugged his performance this weekend at Pitchfork Fest. Those are both great things, but not as great as watching Chance just thrilled to be on a morning talk show in his home city. My goodness, he brought the host (who he’s #wcw’d on Instagram) flowers. And they sent him (and the audience) home with a copy of Paul Blart Mall Cop 2. Chicago viewers are lucky to catch stuff like this, but kids are even luckier, because Chance is leading some surprise field trips this summer with Chicago Parks to places like the Field Museum and the Shedd Aquarium. That fits nicely with the cool PBS vibe that Surf, his latest project with Donnie Trumpet & The Social Experiment, puts out. Just a thought, but Chance and crew would make some excellent after-school specials. Anyway, check out the interview above. Watch the first 15 minutes for the interview and the band’s performance of “Sunday Candy,” and skip ahead to about the 40-minute mark for a performance of “Paranoid” (from Chance’s Acid Rap). This feels like a big warm hug.